Dawin thanked his Filipino fans and the Aldub Nation for the massive success of his song "Dessert": "Thank you guys so much, it wouldn't be possible without all of you. Thank you so much for allowing this to happen. It means a lot. This is home for me." 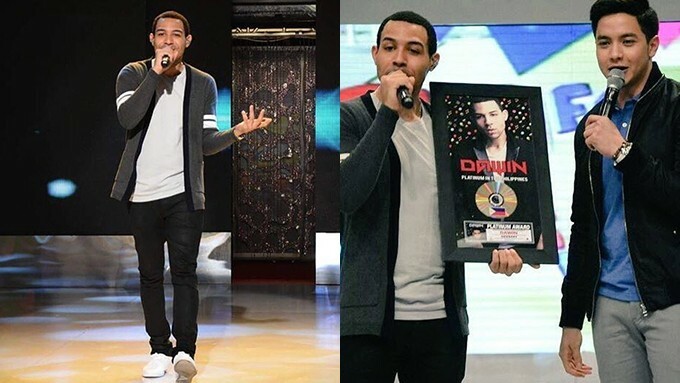 American rapper/singer Dawin returned to the Philippines this 2016. The 25-year-old recording artist is the singer behind the hit Kalyeserye song titled "Dessert." He was in Manila to perform during the 2016 New Year Countdown Party at Eastwood. He visited Eat Bulaga on Monday, February 29, and met with Dabarkads Alden Richards and Maine Mendoza, also known as the AlDub love team. Dawin performed his song live on Eat Bulaga and had a dance off with Lola Nidora (played by Wally Bayola) through split screen. Last October 2015, the American rapper/singer challenged Lola Nidora to a dance-off while performing his song. After watching #Kalyeserye, I would like to have a dance-off with the great @AKOSiLOLANiDORA ????? After the performance, Dawin had a duet with Baby Baste and ate some Filipino desserts including halo-halo and ripe mangoes. Alden handed Dawin his Platinum record award for having sold over 15,000 digital copies of his song in the Philippines. Dawin expressed his gratitude for his Filipino fans and AlDub Nation for their support and said, "Thank you guys so much, it wouldn’t be possible without all of you. Thank you so much for allowing this to happen. It means a lot. This is home for me." Meanwhile, in an interview with Brgy. LS FM's Papa Dan on March 1, the singer said that he had a "super fun experience" during his visit on the show. Dawin told the radio jock, "Super fun experience. Even I was always, you know, preparing for that, because I wanted to show up because I would always get messages and tweets that people are saying, ‘I hope Dawin can come to Eat Bulaga,’ and I say, ‘that would be a good idea.’"
He added, "You know, [I] just [want to] show up and return the love that I've received. So, after that, after the performance, I did a showdown with Lola [Nidora] that was fun."